Neaties offers a variety of medium weight, heavy weight, and wood hangers at very affordable prices. They come in several variations including different weights, different colors and quantities. 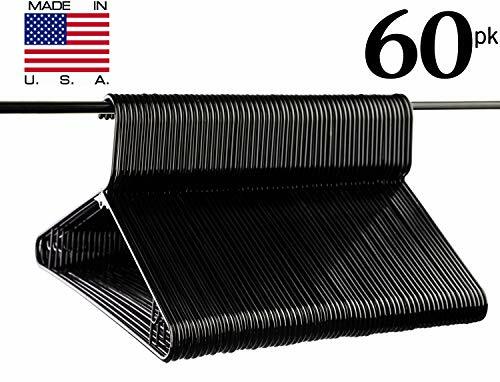 These standard everyday medium weight black plastic hangers are proudly molded and Made In The USA. Their dimensions are approximately 17"x9"x.25" with a 2" head diameter. They are the perfect size for the average adult. Double Bar Hook Feature on Both Sides for Straps and Durability. Single Unit Dimension is Approximately 16.5" x 10" x 1/4". Perfect Size for Average Adult. Value Set of 60 for a COMPLETE Closet. Also available in 30pk. Simply search "Neaties" on Amazon.com! If you have any questions about this product by Neaties, contact us by completing and submitting the form below. If you are looking for a specif part number, please include it with your message.